The consensus view amongst central banks and market participants is that lower interest rates are stimulative for the economy (and raise inflation). In this article, I give an introduction to what is called the “interest income channel” effect which casts some doubt on this view. The interest income channel could explain why growth and inflation have been more sluggish than was generally expected after the end of the financial crisis. I will quickly define the interest income channel. In order for an increasing dollar amount of goods to be purchased by the household sector, households have to have an increasing nominal income (or increase borrowing). Wage incomes will rise as the result of increasing numbers of employees, as well as wage inflation. However, people living off of financial assets also need increasing income to keep up with nominal GDP growth. Low interest rates squeeze incomes for that segment of the population. I have generally seen little discussion of this effect in mainstream analysis, other than responses made by central bankers to older citizens complaining about the pitiful interest income they receive on their savings. The consensus view is that the gains for the overall economy outweigh the suffering of a few pensioners. However, many unorthodox economists argue that the effect of lost interest income could be more important than the other effects of low interest rates For example, this article by Linwood Tauheed and L. Randall Wray covers this subject in greater depth. This criticism is not new; very similar points were raised in the 1970’s, although the concern then was that rising interest rates were helping to fuel inflation. The question was subjected to a fair amount of analysis. By the mid-1980’s, the mainstream consensus was that the empirical work strongly validated the conventional thinking that lower interest rates stimulated the economy (and higher rates slowed the economy). The Volcker experience provided an example that high interest rates killed inflation. Over time, I would like to look at the empirical analysis. But I will just show here some of the relevant data, in order to give an idea of the potential magnitude of the interest income channel effect (but please see the notes below). The chart above shows the interest income received by the household sector since 1950, scaled by nominal GDP. The lower panel shows the change in the amount of interest income received (also scaled by GDP), averaged over a two-year period. This chart shows what I view as an important difference between now and the 1970’s. People often draw the parallel between the negative real interest rates we have at present and the negative real rates of the 1970’s. Those negative real rates are commonly held to be the source of the great inflation of that period. However, what we saw during that period was a trend rise in nominal rates, and so interest income was rising. This helped the household sector to keep up with inflation. 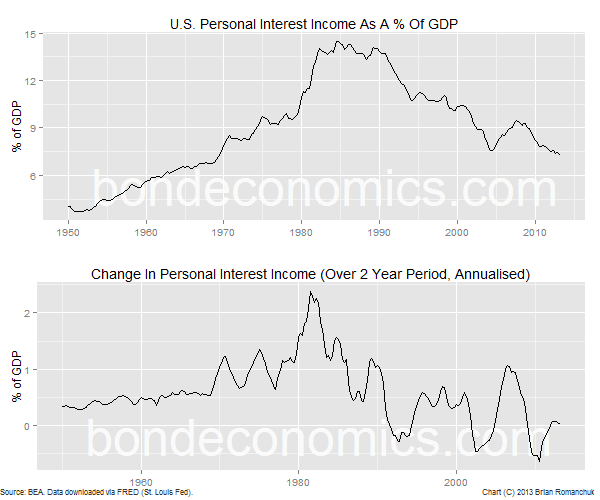 Conversely, the present cycle has seen a drop in interest income, which happened to coincide with sluggish nominal growth. That said, the effect has now leveled off with interest rates being stuck at the same low levels for some time. Although this chart is suggestive, I will point out that it provides an incomplete picture. The households who are net payers of interest are presumably less wealthy than households who are net receivers of interest. They will probably have a higher rate of consumption out their income than the people who are net receivers of interest income. This means that $1 less in interest paid by the household sector should have a greater impact than a $1 increase in interest received. I do not know whether these data includes interest income received by financial intermediaries for the household sector, such as pension funds. However, in addition to the drop in current interest income, defined benefit pension funds are being crushed by lower discount rates on their actuarial liabilities (which will not show up in the income flows). Lower interest rates have encouraged mortgage refinancing. (This is mainly a U.S. phenomenon; other countries generally do not have long-maturity fixed-rate mortgages.) This generated a short-term boost to growth, but it creates a longer-term drag as increased principal payments force the savings rate higher (debt repayment is a form of savings in the national accounts). The "Wealth Effect" should counter the loss of interest income; rising asset prices in response to lower policy rates should stimulate the economy. Even with this disclaimer in mind, I argue that low interest rates are a subsidy for the government and corporate sectors at the cost of the household sector and foreign holders of domestic debt. Given that the main constraint on growth in the developed world is sluggish consumer demand, this should be at least a small drag on economic growth. Good points here. The impact of interest rates is a complicated issue because there are so many conflicting effects. As I understand it, the reason neo-classicals and neo-Keynesians don't place much importance on the income effect is that they tend to be looking at homogenous infinitely-lived agents. In such a world, with Ricardian Equivalence as well, there is no overall income effect. Everyone's additional interest income is everyone's additional interest expense. Such a model seems to me to completely miss the most important thing about interest income effects, which is the distributional aspect, both between rich and poor and between consumers at different stages of the life-cycle. I am still getting to grips with DSGE models, but I believe that the interest income channel effect does exist, but it is overwhelmed by the other effects on interest rates. Nick Rowe had an article about interest rate channels, and how you have to look at the model as a whole and not do what I do here, attempt to isolate channels of transmission. What you end up after your model fitting exercise is the impulse response of economic variables in response to an interest rate move. It may be possible to play with the parameters to get an impulse response where the interest channel effect dominates the impulse response, but such a parameter set presumably does not fit the data (at least based on the way they have done the fitting). Bryan, do you happen to have handy the link to Nick Rowe's article on interest rate channels to which you refer? Thanks. The article was on Worthwhile Canadian Initiative.